Inky Fairy Designs: Simply Betty New Emo's - My guess: Halloween Theme! Simply Betty New Emo's - My guess: Halloween Theme! For my card I used Betty herself - isn't she fabulous?! Omg, seriously love her. I love her outfit, I love her hair, I love her big bright eyes. Everything! I had a blast coloring her with copics. Then I pulled out some of my grungboard shapes & used the spooky house & pumpkin for the backdrop. I added some texutre to the house with one of my new TH texture plates - burlap. I've had this ribbon tape since last halloween & pulled it out to add to the strip behind betty. I cut out some of the bats and added them here and there for some added flair. Now, I hope you like my card EVEN if it's the wrong theme, I had a blast making it! I also VERY loosely used the sketch challenge at Simply Betty Stamps blog b/c the only thing better than winning these awesome stamps would be to get a chance to be a guest DT member!!! Now, I can't wait for tomorrow for the sneak peeks to begin and get my hands on them when they are released on the 15th!!! Thats so cool your right we both have two totally different guesses, good luck to you. I can't wait to see the card you make for the GDT spot. 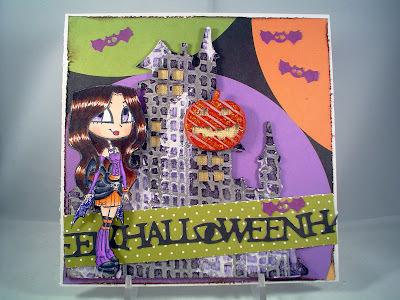 Oh Carisa, this is a fabulous Halloween card and I love how you've made Betty all ready for Oct. 31st! Gorgeous coloring and card! LOVE this! The grungeboard backdrop is fabulous... not to mention how you colored up Betty... wonderful work! Thanks for playing along with the Simply Betty Stamps challenge! Beautiful card Carissa! I love the theme! Just gorgeous the way you colored her up! Thank you for joining us on our first ever challenge at Simply Betty Stamps!